It’s 10 minutes to 4:00 a.m. and I am wide awake. My alarm is set for 4:00 a.m. but my mind is in a hurry to start the day and doesn’t want to wait to be alerted. I scramble to my feet, excited to start the adventure of my life. An entire three weeks without the responsibility of caring for 3 lovely children, 2 huge dogs, 2 smelly rats, and 1 very large house that is a pain to clean! My poor husband is still snoring away, unaware of my excitement and eagerness to get going. I race to the shower, thinking about all the things I still need to do before we leave. Shower behind me, I’m a mental mess now, dripping water all over the place as I hastily dry off, fearing that I’ve forgotten something. My impatience is growing as I return to my bedroom and find that my dear sweet husband is still sleeping peacefully. The low sound of his rhythmic snores begins to echo in my brain and pulls me into a tizzy. In a semi-aggravated state, because obviously he isn’t aware of my eagerness to begin our adventure, I begin the process of waking him up by gently pushing against his shoulder. He lets out a few deep snores and smacks his lips together a few times before he turns to face me. I can tell that he is obviously not excited about getting up this early in the morning and he looks at me quizzically, one eye closed as he tries to adjust his eyes to the light coming from the bathroom just behind me. After several blinks, he is finally awake and sitting on the edge of the bed. I can hardly contain my excitement any longer and throw my arms around him in a tight embrace. “It’s time to get going!” I announce. He gives me a bit of a smirk and then trudges to the bathroom to escape my cheery disposition. I am a little disappointed in his response and hope that he will have a little more enthusiasm during the next three weeks. After a little coaxing, saying goodbyes, packing the car, re-packing the car, and last-minute straightening and reminders to everyone, we are finally on our way. It’s now 5:15 a.m. and I am already annoyed because we have to stop for gas since we forgot to fill up the gas tank yesterday. I really just want to get going. The good thing about stopping is, now we have our morning coffee and soda to get us through the next 8 hours until we arrive at our first destination which is Mitchell, SD. I don’t know why I am so excited about Mitchell, SD in the first place. The only thing we plan to do there is visit the Corn Palace, and if I remember correctly, the last time I was there 11 years ago, there wasn’t much to see. Brian grabs my hand and bows his head in prayer. I quickly bow my head as well and pray along with him. With a final “Amen!” and a shared thought that passes silently between us, we head out onto the highway to continue our journey. We drive for about an hour, before both of us have to pee. Now we are second guessing our choice in drinking coffee and soda. This could make for a very long trip if our bladders keep forcing us to stop. Oh well, at least it’s just us that we have to worry about. If the kids were with us these stops would be a whole lot longer. About 20 rest stops later… we are finally here in Mitchell, SD. We head over to our hotel which is a Comfort Inn. The place is pretty nice and the bed feels comfortable as I sprawl on top of it in happy revelation that we finally made it here. We decide not to lug all of our stuff in right away and head out to find the Corn Palace first. We don’t want to miss our opportunity to see this wonderful sight and were afraid it may close early. After taking a few wrong turns, we finally find it amidst the crowded buildings in the downtown area. It’s muggy outside, there’s road construction going on, and we aren’t quite sure where to park. Eventually we find a public parking lot across from the Corn Palace and park the car. I am grateful that we have finally made it here and just want to see something exciting and take lots of pictures. I am a little disappointed at first glance to see that they aren’t finished with the new exterior of the Corn Palace. Every year they change the theme and designs. 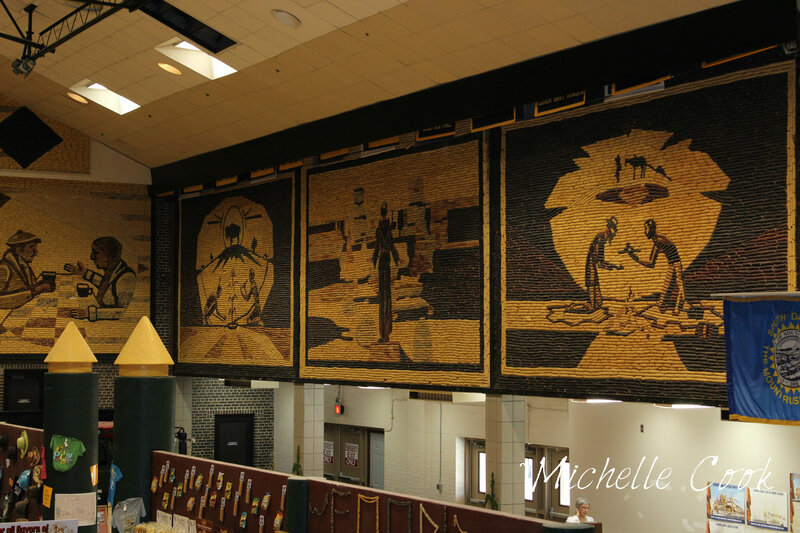 Once inside the Corn Palace we are able to view pictures of the Corn Palace from all of the prior years. 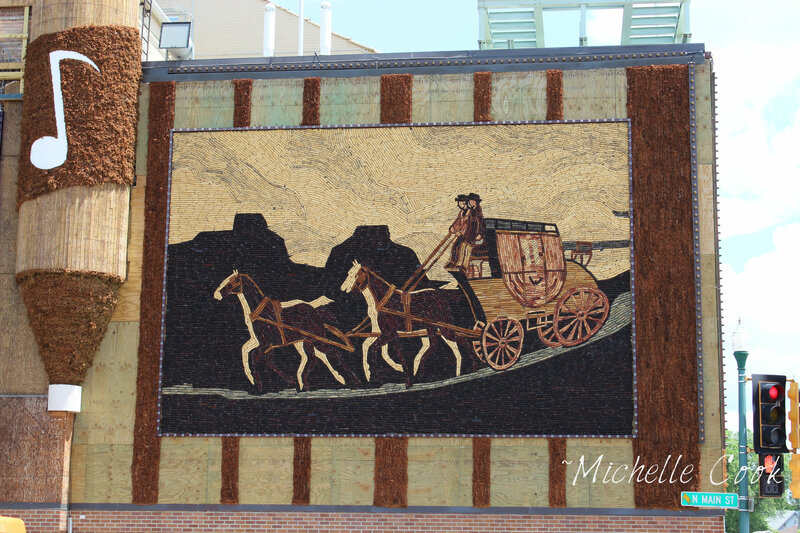 A Corn Palace Video blares in the distance, explaining the story of the Corn Palace. There’s a gift shop in the middle of a stadium seating area that gets our attention. We walk around the place for a while and discover some interesting facts. 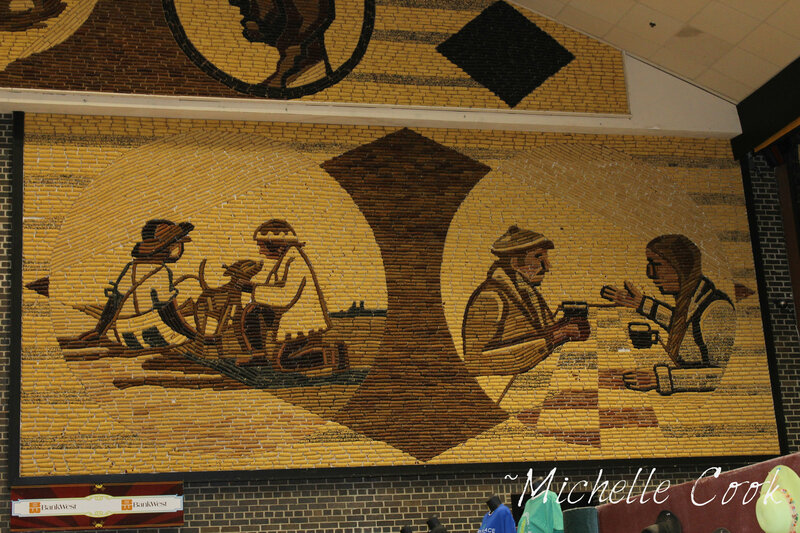 We learn that over 275,000 ears of corn are used each year in redecorating the Corn Palace and that all the colors of corn are naturally grown from special seeds raised just for the Corn Palace. Each color is apparently planted in separate fields to maintain its pure color and the Corn Palace Festival Committee selects a new theme each year. After taking lots of pictures, buying a few souvenirs for our girls, and perusing the local shops in the area; we head back to our hotel to figure out what else we should do. Both of us are tired and hungry and noticed a Ruby Tuesdays Restaurant just a short walk away from our hotel. We decide to call the kids before we go and eat dinner, but unfortunately we now find that we have no cell service and no internet. A wave of heat hits us as we head out towards the restaurant. The temperature and humidity have been rising all day and even the short walk to the restaurant feels overwhelming. The restaurant is almost empty and I wonder if we should go elsewhere. A vacant restaurant in my opinion, is usually a bad sign. We order some burgers though and the pretzel bun burgers we order are really tasty. We order cocktails and spend a good amount of time talking and laughing. It’s the first time I’ve sat down with my husband to have dinner alone with him in what seems like ages. With full bellies and feeling a little lightheaded from the cocktails, we decide to walk to a nearby mall. It feels good to walk around holding hands and just be together as a couple. Exhaustion soon starts to overtake us though and we decide to head back to our room. Both of us plop down on the bed and fall asleep within minutes. The early morning, the long drive, the excitement of the day, and the fullness of a good meal, have laid the foundation for a good long rest. I’m looking forward to reading more of your adventures and hope the inner little girl finds her way out into the open to frolic without thought. 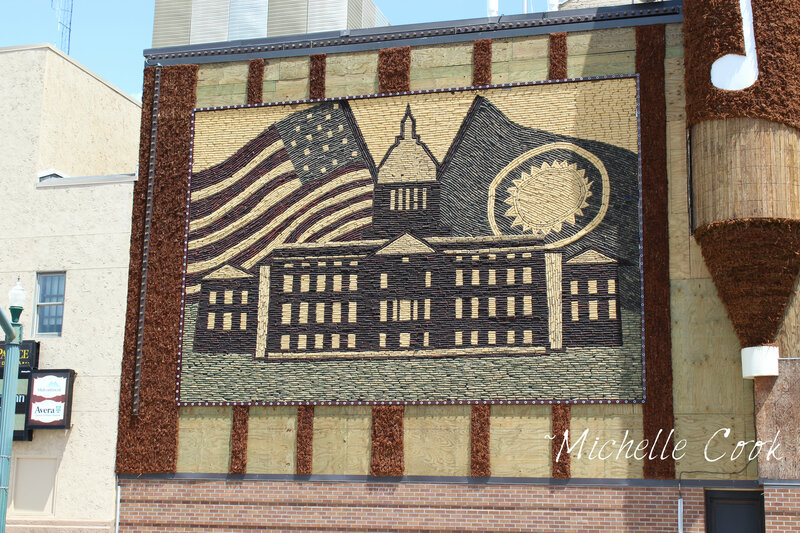 Many years ago, on a family vacation, I remember going to the corn palace. You are a great storyteller. I loved the early morning tension of you rushing about. What young mother with lively children, a big house and multiple animals wouldn’t be looking forward to spending time away with the man she loves? Thanks Sheri! I’m glad you enjoyed my story and it’s good to know that somebody else can relate to this. I enjoyed every second of our trip and I am still feeling more happy than usual because of the great adventure that I just had. I am enjoying your stories as well. I am thankful you kept a journal to remind yourself of all those years ago. I need to get better about doing that on a more regular basis. It was such a nice adventure for your first day. I can imagine being in there and your explanation to your excitement was very detailed. The excitement was suddenly overflowing within myself too while reading it! Yeah you’d better write up as soon as possible because usually the excitement will be worn off a week after. I can’t wait to see more of course 21 days in a row trip of course It’s exciting! I kept a journal the entire time we were gone. It’s not as detailed as what I wrote here on WP. I wrote just enough in my journal to jog my memory so that I could write more when I got back. I’m glad I kept that journal, or I wouldn’t remember half the stuff we did. My husband was reading what I wrote for day 1 and had me go back and add something after it was published that I had completely forgotten to write about. I guess this will be a joint effort in writing about this trip. I really wanted to do this as a keepsake for us, but at the same time, I thought it would be fun to share it on here too. I did a similar trip with just my girls 11 years ago. It’s been fun relaying to them all that I saw and how different everything is now, all these years later. Ah a journal which was a lazy thing for me to do. Please I need it lol. Nobody cares that much if you forgot to add something but for me it’s more than fun especially for your own travelling activity. That’s all that matters! I think you probably read the last part I added in, because I added it awhile before your first comment. You should keep a journal if you have a chance next time. The only reason I kept one was because I had explained to my financial advisor that we were going on this trip, then all of a sudden one day I got a journal in the mail from him to take on our trip. I have never had somebody do something like that out of the blue and I was really surprised. I guess explaining what this trip was all about and how much it meant to me, really spoke to him somehow. I fully agree on that journal thing. I should do that especially on the place that I have never been before. You know writing this stuff on your blog will probably benefit on yourself one day aside from your writing journal purpose. Thanks Raymond! I’d send you a journal myself, but I fear it would cost an incredible amount. I once sent a small package to Hungary and it cost me $150.00 to send! Probably! Lol! 🙂 Have a great day!